Design Thinking is a process used to solve problems. While traditionally a process coveted by only Designers, it has been used to solve problems in all disciplines. There are a few variations on the process, but we will use the following version: Empathize, Define, Ideate, Prototype, and Test. At the core of Design Thinking is the idea that you must build empathy for your users before designing anything. Design Thinking is best done in interdisciplinary teams. It's important to have people with different backgrounds to fill in the gaps of each other's knowledge. Our team consisted of myself, Vivian Wang, Jack Rider, Carly Bernatovicz, and Kelly Grosswendt. We all came from different majors and universities, which definitely made the process more productive and dynamic. How can we help students manage their money while abroad? The most important thing to do when interviewing someone is to ask "why?" Most of the time people don't consider all of the inputs that contributed to decisions they've made and the way they think. By digging deeper, you can understand what makes your users tick and what their real needs are. Often, the thing the user thinks they needs, is different that what they actually need. This is why it is important to look past the answers and notice the way the interview subject reacts. Are you actively managing your money/budget while you’re abroad? How? What do you find to be the most challenging part about managing your money/budget? Is there anything that you wish you knew how to do in regards to saving/budgeting? Did you have any experience managing your own money before going abroad? If so has that changed at all since you came abroad, and how? Where did you learn about managing money? Can you think of specific moments abroad when you thought to yourself, “oh god, i should really be watching my money/my spending habits”? Where do you learn how to budget? From word of mouth, personal experience, etc? Surveys are great because they allow you to easily collect a large amount of information from a large number of people. Surveys are also a great tool to help visualize results (seen below); however, there are some downsides to conducting surveys. They often don't tell the whole story. When no one is looking, your user might not tell you the truth, and you definitely can't ask "why?" if they give you an interesting response. Below are some of our survey responses. If you would like to view our survey, you can click here. 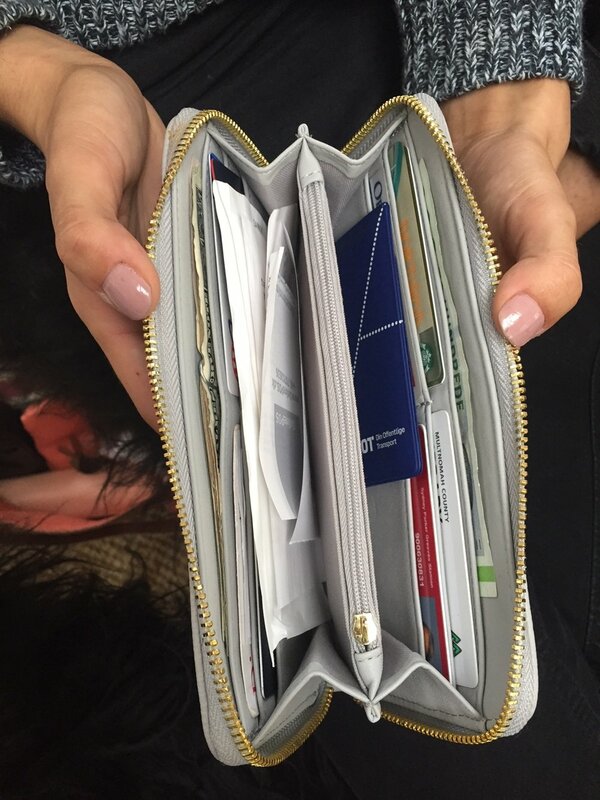 Our key cultural probe was an examination of users wallets. This gave us some valuable information and caught a few people by surprise. We were able to see that some people were intensely organized while others were not. Some even kept all their receipts but did nothing with them. We also tried an approach where we asked people to show us a picture of their favorite purchase they made abroad, but that mostly resulted in Instagrammed food, which we see enough of as it is. What are some behaviors while managing money? We began by drawing an empathy map, dividing our information into four categories: Say, Do, Think, and Feel. Often, a few of these categories will contradict each other. Why? Because users often say one thing and do, think, or feel another, and this is a descrepincy that must be spotted. "I swipe and I forget"
"If I didn't spend much on breakfast, I'll let myself have a bigger lunch"
"I put everything I spend in a spreadsheet"
"I am being ripped off"
It was important to us that we use our information to define the real problem. Thankfully, if we got it wrong, we could always come back to any point in the process. This is one of the many benefits of the design thinking process; it is flexible. We noticed that everyone, no matter their budgeting techniques, felt anxiety about budgeting while abroad. This led to a change in our problem statement. How might we help DIS students better manage their money abroad? How might we help DIS students better handle their emotions while managing their money abroad? A “predictive” budgeting tool that tells you how much you can spend, instead of how much you spent. Budgeting the Game, an app with leader boards and rewards that you can unlock by meeting your goals and beating your friends. We brought in a wonderful team of users to ideate with us. Vivian and I gave a description of the project, and an overall description of Design Thinking. Then, Jack and I went through a mock brainstorming session. We used a fake problem - how can we improve Sriracha consumption in a cafeteria. We really wanted to demonstrate the value of deferring judgement, encouraging wild ideas, and building off the ideas of others. We came up with some crazy ideas, like creating Sriracha vending machines and a Sriracha rewards program where you can eventually earn Sriracha gear. We checked in, and made sure our new guests had a good understanding of the task at hand. With sugar coursing through their veins, we gave them 3 minutes to individually brainstorm as many ideas as possible. Afterwards, we reconvened and used the dot-mocracy method to pick out the favorites. We chose the top ideas, and let our guests conduct a longer-form brainstorm and build off the top 4 ideas. Once they had finished, we thanked our guests and reflected on their ideas. We saw that they had very similar thinking to ours, which told us we were on the right track. They generally involved an app that focused on budgeting and positive thinking. With those two ideas in mind, we chose to pursue Budgy, an app with leader boards and rewards that you can unlock by meeting your goals and beating your friends. Our thinking behind this idea was that we could swap anxiety for a more positive emotion like competition. We thought that this idea struck an excellent balance between feasible, viable, and desirable. It was then onto story boarding. We wanted to show a video that told the before, during, and after of a user's experience. This resulted in the video shown below. We had a blast making the video, and it turned into a cool was to showcase our work. Here are also some wonderful mock-ups of our app that Vivian made. It really encapsulates the fun, stress-free vibe we wanted for the app. Now It's Time TO Test! We tested our prototype (our video) with a presentation to the class. Unfortunately, we did not take pictures of us giving presentation, but I've attached some of the presentation below.